Recently, while hanging around speaking to some fellow podcasters in our ~super sekrit channels~, the conversation turned to the New Player Experience. 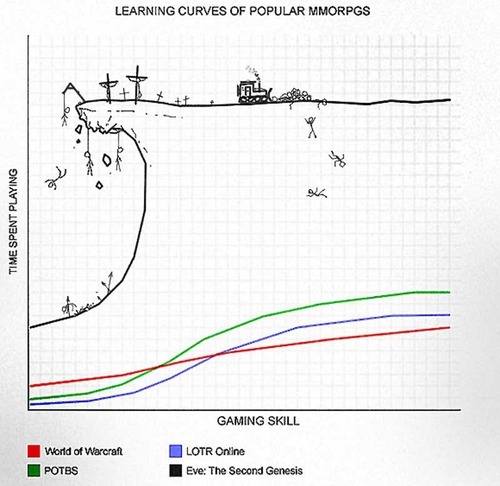 Eve Online is notorious for the steep learning cliff and the NPE is something that all players have to go through. This topic is something that Xander and I have extensively discussed in previous episodes of the podcast, but as CSM election season rumbles forward with ever-increasing pace, it appears to be rearing its head once again. Who cares about new players? You should because if you are a null sec PvPer or a high sec miner, they are vital to the game. Without fresh blood and the money they provide CCP, we experienced players simply won’t see new features and content. That’s before we even consider the joy that can be had from a noob’s tears as they learn that forever-important lesson of their first big loss or the excited voice on comms from their first officer loot. New players are the lifeblood of Eve. Without them we are shackled to a game with no future. There are a number of differing opinions out there. Random McNally from the High Drag podcast and DaeHan Minhyok (CSM candidate) from Podside had a discussed a few ideas on the subject with me and there are countless blogposts out there from others in the community on the matter. I won’t discuss them all here because I simply don’t have the column space nor the time to read and digest them all. They all generally come down to a few lines of thinking. The first idea is to have an area dedicated to new players. And yes, I’m well aware that there are already new player systems in game where they can’t be harassed, but go visit one with a new character and you will soon see the sharks circling. The ‘no harassment’ rule is vague and unenforceable without strict policing. It simply does not work. So what can be done to change this? One option would be to create ‘super’ high sec pockets for new players to run training missions in with restricted shiptypes, increased police presense, adjusted security and so on. The fundamental idea here is to create a nursery to nurture new players and wrap them in cotton wool them until they begin to understand the fundamentals of the beast that is Eve Online. I hate it this idea. I absolutely reject it. Maybe there is a working solution implementing this system but I don’t see it. I am completely against the creation of safer zones because without total control over every aspect of these areas, from the markets and contract system through to the entry and exit gates themselves, they cannot work and what we’re left with isn’t the game we know as Eve Online. Now this is a better idea and one worthy of some further investigation, however the underlying issue is that new players might not know which areas are defined for them. Let’s face it, at some point they are still going to make that jump to an unsafe system completely unprepared for what lies ahead. It’s a long time since I have been crowbarred through the New Player Experience but I remember it reasonably well. Between the annoying pop-ups and warnings, along with the tutorial windows flying here, there and everywhere, it was incredibly confusing and bewildering. In the end, I simply clicked past without reading them or understanding the gravity of what they suggested. By the time the first can-flipper dropped his bait in front of me it was too late. I was already de-sensitised to the warning system and simply clicked past it as another irritation getting in the way of what I wanted to do. As a system, it was flawed. As I understand, there have been many necessary improvements to the tutorial system since I started the game, but there remain some huge gaps in new player education. The following strikes me as a potential solution – introduce piracy mechanics into the tutorials. At the moment, they cover things like courier missions, basic combat and autopilot functions, along with exploration and scanning all at a very simple and basic level (that is never really expanded upon as you move up the tiers of mission running). It would be a worthwhile experience to be ganked by an NPC during a courier mission. An NPC alpha fleet sits in an NPC drag bubble in line with a warp acceleration gate and instapops you when you land. CCP could add missions where the player must run a gatecamp to catch an NPC as he tries to escape a system. We could see cargo scanning missions where the new player must try and find something of value carried by an NPC which when found results in Concord’s almighty fury. What problem do these suggestions solve? Instead of the player losing a massive percentage of their worth due to lack of experience, they would be given a ship (as already happens in some missions) that they must fly for a mission. When they lose that ship, they suffer no monetary loss. They return to their agent who doesn’t reward them for that mission, however places a bounty on the NPC that exploded their ship or cargo. The whole idea feeds into the Retribution theme and teaches new players the basic mechanics of ganking and bounties. Rather than complaining that other players are bullies, they learn about the harsh realities of Eve Online in a controlled manner. I hope you have an opinion on a subject that should matter to us all. If so, feel free to share in the comments below. The larger the playerbase, the better Eve Online becomes (and the more targets we have in future).